← Cartoon about dementia – with music! The first week of the internship consisted of learning about Health 2020. I got to participate in a brainstorming session on life course as it will be applied in the Health 2020 policy framework, with a particular focus on healthy ageing and my background in Gerontology (as life course is a theory of ageing). I also sat in on a meeting on preconceptive health and health care and how this will be integrated into Health 2020 and wrote a short summary to be used on the extranet. I also discussed the internship tasks and goals with my supervisor. We highlighted 5 primary tasks to work on during the internship and outlined a time plan to accomplish the tasks. The overall focus of the internship was to see how eHealth can be incorporated into the Age-friendly Cities program. The next few weeks of the internship included an introduction for interns and new employees. 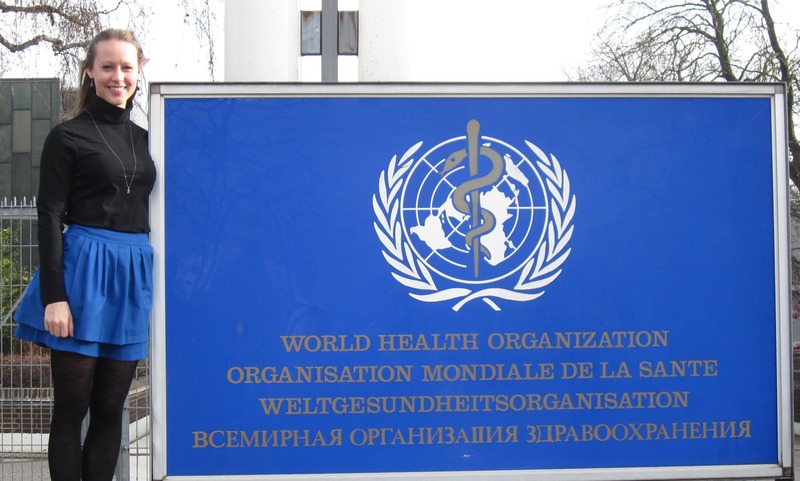 This meeting was important in explaining the structure and process of the World Health Organization, how the United Nations and World Health Assembly fit in the picture and how to find our way around the intranet site. There is a lot of information on the site, but there can be a deep hierarchy, which makes it difficult to navigate and find specific information easily. It was also informative to find out about the funding and implementation cycles and to understand which phase we were in during our internship. I attended a NCD Action Plan implementation meeting and created a glossary of telehealth terms in collaboration with the WHO Collaboration Center on telemedicine, the Norwegian Centre for Integrated Care and Telemedicine. As terms like telehealth, eHealth and telemedicine are often used interchangeably, I wrote a brief document on the history and distinctions of these and similar terms, based on a Telemedicine course I taught at Aalborg University. I also met with the head of the eHealth and Innovation division, and we discussed common goals and the direction of my internship project. After reviewing documents on the WHO Global Network of Age-friendly Cities, I started to focus on how eHealth supports the guidelines. This entailed looking at current policies regarding eHealth in the Region of Europe, the expressed eHealth needs of the Member States and success stories to draw a base to start from. Then, I could make some suggestions of how eHealth could be integrated into the current guidelines and additional checklist items to qualify cities in the Age-friendly network. This also meant incorporating recommendations from the Healthy Cities initiative, so that eHealth, Age-friendly Cities and Healthy Cities are more cohesive in achieving their goals. Finally, towards the end of the internship, I focused on current and envisioned privacy issues in eHealth and how the WHO can address these issues and integrate them into policy work now. Working with the SO4 team, I gave a briefing on web consultation in the Post-2015 agenda and looked at the Operational Planning requests of Member States for planning 2014-2015 outcomes in Healthy Ageing (Outcome 10). It was intriguing to be able to look into what the countries are requesting for assistance and how they are planning to address population ageing. It was also eye-opening to see how the system of requesting, meeting at face to face meetings, coordinating, etc. takes place to implement policy. Another valuable experience was attending the General Staff meeting, let by Zusanna Jacobs, the WHO Regional Director for the Region of Europe. Although much of the information did not pertain to my internship project or my career, it was interesting to hear the status of the Region of Europe, budget planning, what activities or changes will be coming up and employee questions. My office was located in Communicable Diseases, next to HIV, malaria, TB, etc. The colleagues in the office were friendly to work with, but since it was not in the same building as my supervisor or other staff in my Division of NCDs, it was not an optimal location. I was also completing my PhD with the writing of my dissertation at the same time, and this was a bit too demanding to be carrying out simultaneously; I would suggest that future interns are not finalizing their thesis at the same time as the internship. There was only one full time staff working with Healthy Ageing in the office, my supervisor, and he was often on duty travel and I couldn’t quite consult other colleagues on issues or questions that came up as ageing was not the focus of their work. However, when I did work directly with my supervisor, I found him engaging, enthusiastic and supportive of my work. Attending the weekly SO4 meetings (Strategic Objective 4: To reduce morbidity and mortality and improve health during key stages of life, including pregnancy, childbirth, the neonatal period, childhood and adolescence, and improve sexual and reproductive health and promote active and healthy ageing for all individuals), meeting with the other interns at lunch and the weekly SO4 breakfasts were staple activities during the internship. These were where we got to know one another, learn how our colleagues do their work, and have the opportunity to ask questions about the WHO structure and practice. It was motivating to work with the WHO in my field of study. Many of the other colleagues, particularly those in SO4, were welcoming and helpful; I really got the impression that this would be a pleasant and fulfilling environment to work in. This entry was tagged Copenhagen, Denmark, eHealth, Europe, Global Network of Age-friendly cities, Internship, World Health Organization. Bookmark the permalink.